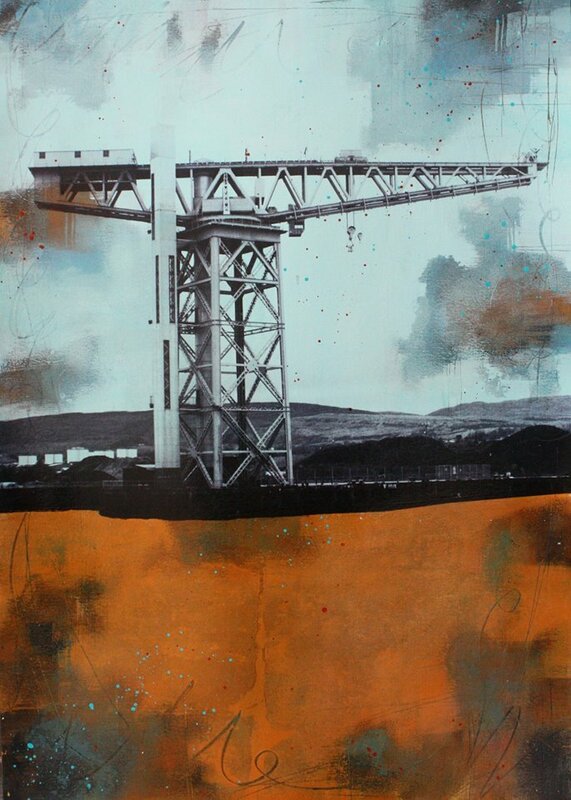 Today we are rummaging around the Glasgow-based work-space of Claire Kennedy; finding out how and why, she brings together painting and photography, in her beautiful, mixed-media impressions of Glasgow. 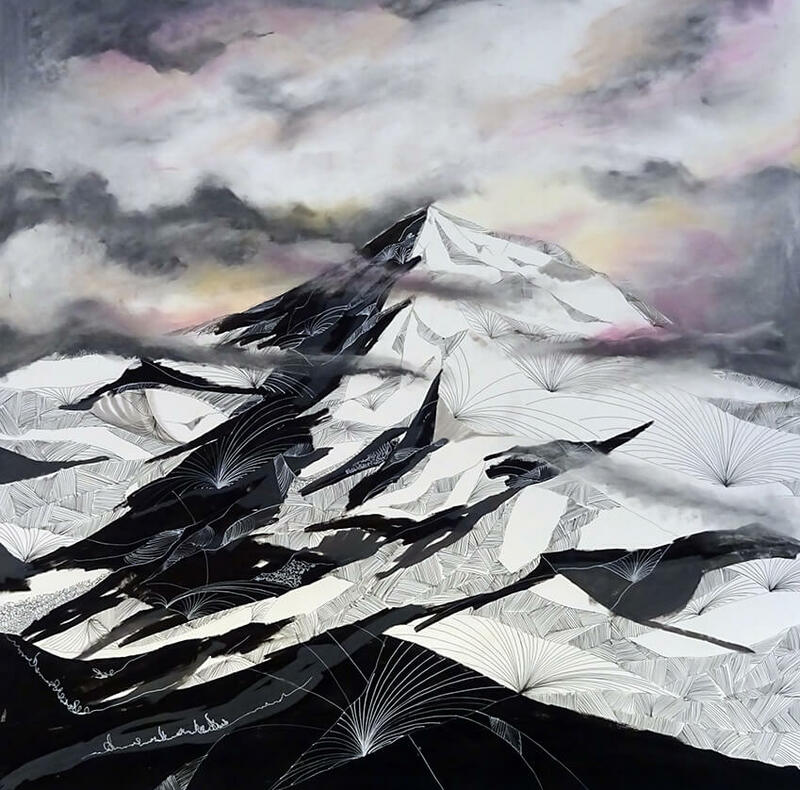 We want to share with you an insight into her life, her ideas and her arty methods; to find out how some acrylic paint, and a black and white photograph, can become the rich and gorgeous work, we have hanging on our walls. 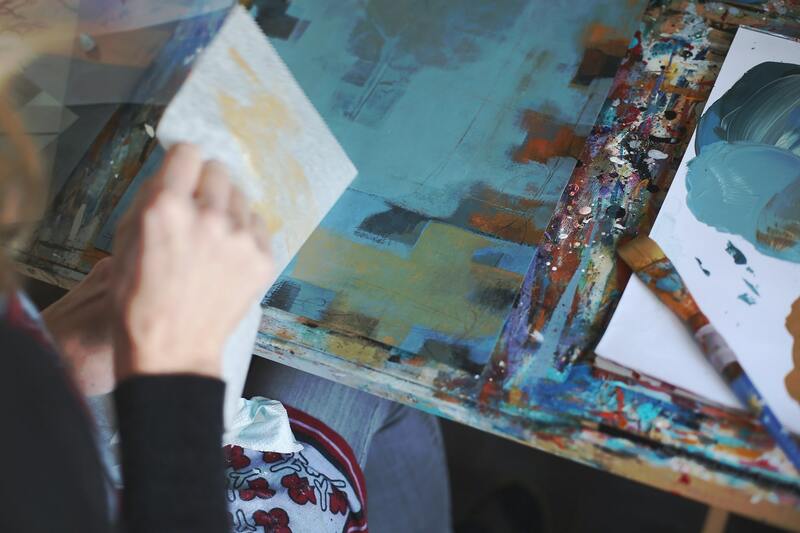 A few years ago, Claire left work as a teacher to start a family and deepen her art practice. She has been working as a full time artist now for three years. She is largely self taught, with no formal education in art-practise. Her venture into painting began with a period of experimentation, where she tried out lots of different mediums and processes. For a time, she pursued screen printing. But this didn’t quite work for her; with a young family she needed to be able to work from home. So, she started exploring ways in which she could create new effects at home, through her own methods. To start finding a way to produce the work she wanted to, Claire turned to artist Julie Prichard. Julie’s book Acrylic Solutions (2013), and her online workshop Pixels and Paint (2011), greatly inspired Claire’s exploration into how painting and photography could work together, in a beautifully-unified way. For the past 200 years, painting been posited as the polar opposite to photography in pretty much every single way; with photography representing logic and reality, and with painting representing fantasy and, so called, ‘art’. Photography is conventionally perceived as the medium that represents reality, as we see it through our own eyes. It is sharp, compact, and neat. It’s seen to bring clarity to the forms that painting complicates, through abstraction. Painting, on the other hand, has that ability to be scrubby and textured; to defy reality and mesh together any number of colours, shapes and ideas. Claire defies this archaic opposition, bringing together these two mediums, to create her gorgeous decorative surfaces; like that of Gustav Klimt. At a distance, Claire’s work has the aesthetic effect of aging, analogue photographs; capturing unique views of Glasgow. However, at a closer look, her work is made of acrylic paint, worked to create complex layers of texture, colour and form. A black and white photograph is then laid on top of the painted surface; seamlessly worked into the painted layers. 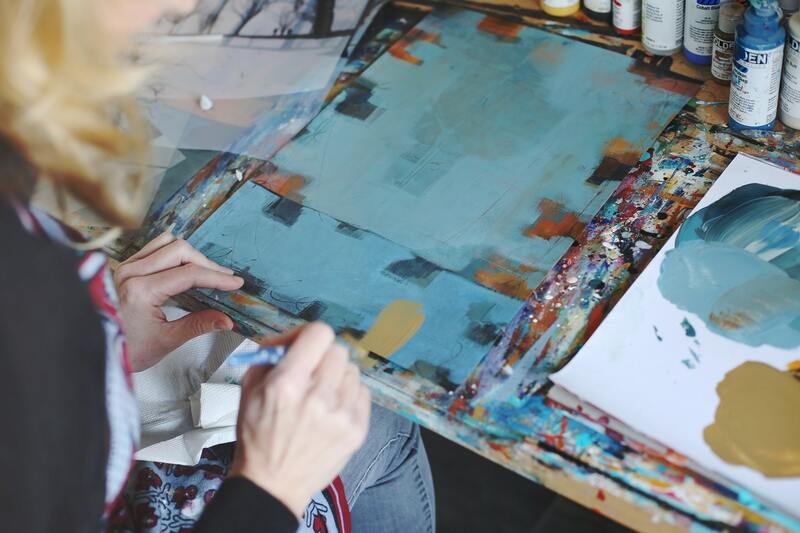 Claire usually begins her process by painting the background of her work black, or another dark shade. This is the foundation from which she builds the deeply textured surface of each painting. At this preliminary stage, her focus is on experimentation. She enjoys the process of laying down the paint, and seeing what-fits- where, building up a thick textured surface. 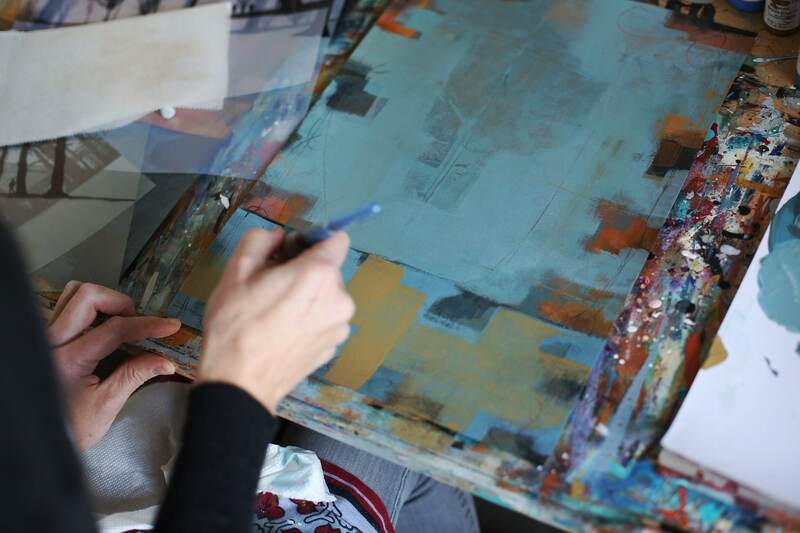 Layering, lifting and excavating, are all words that Claire uses frequently, when describing the painting stage of her work. For her, painting isn’t about precisely placing paint down, into meticulous forms. Instead, she scrapes paint away, lays it down, moves it, smudges it, and uses any number of different implements (grease-proof paper, old credit cards, tools, rags) to create various, textured effects. Claire’s work can be made up thirty different layers of paint (and sometimes many more! ), manipulated in a plethora of different ways; leaving a rich, unique surface. Her interest in layers really ties into her love of old, weathered things. She loves the textures and patterns that build up on things, over time. She recalls, for example, seeing a rusty swing, in a local park. 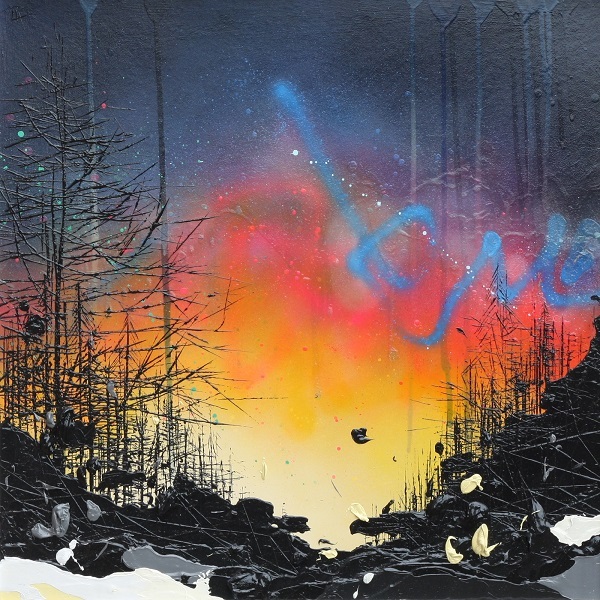 She was drawn to the character and effect that was created by the layers of chipped paint. 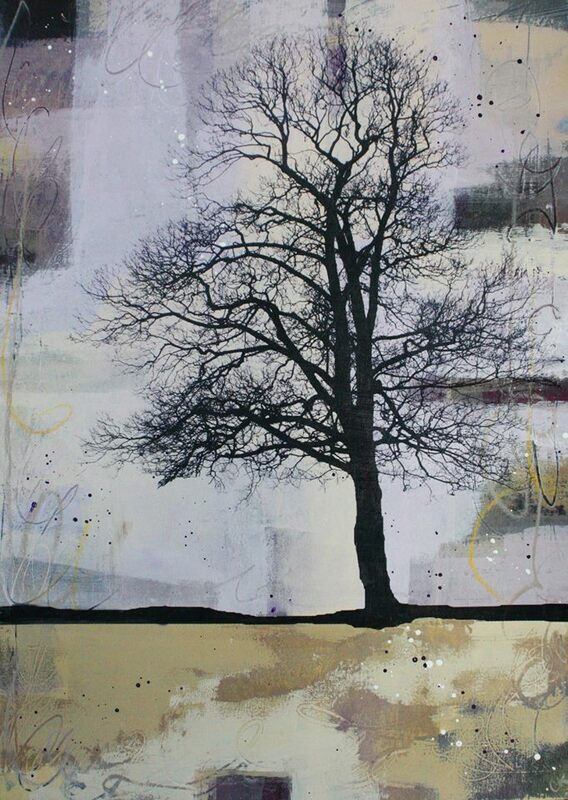 For this reason, depth of layers is an idea that she brings into her own work. When Claire is happy with her painted surface, she coats it with a substance called Digital Ground, which provides the base on which to print her photograph. She selects photographs of things with bold forms, such as trees and cranes. This is directly printed onto the surface of the work. The starkness of these photographic forms is really satisfying. It contrasts with the texture of the paint, unifying everything into its final form. Despite her love of playing with her paint, in the early stages of each piece; unity is really important to Claire. She always selects complementary colours for her work. Then, over the top of each painting, she adds a tinted glaze. This glaze, adds that final layer of cohesion, which brings everything together into the finished work. SO, there. 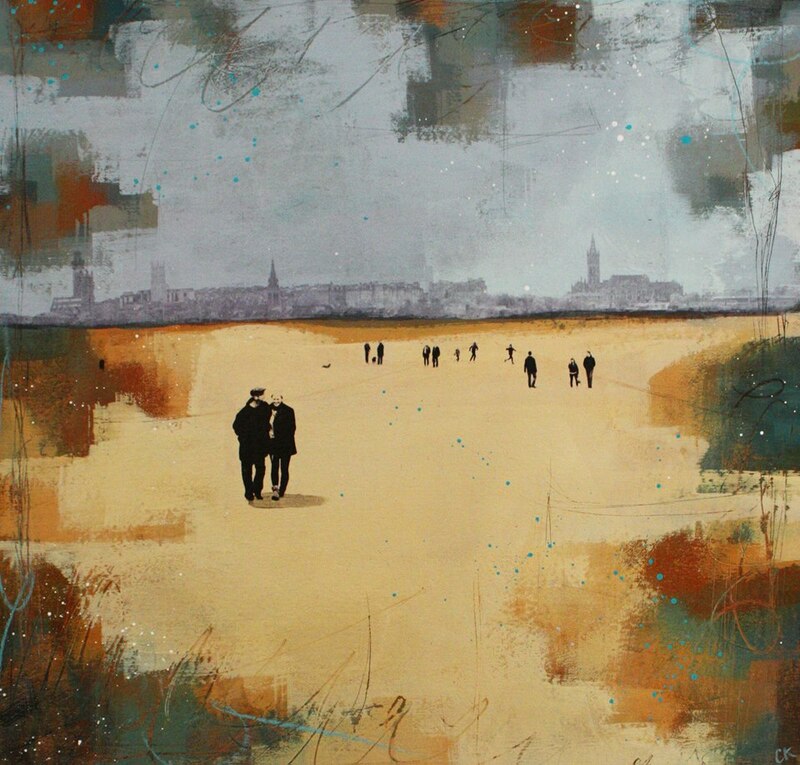 That’s Claire Kennedy and her beautiful mixed-media works of Glasgow. 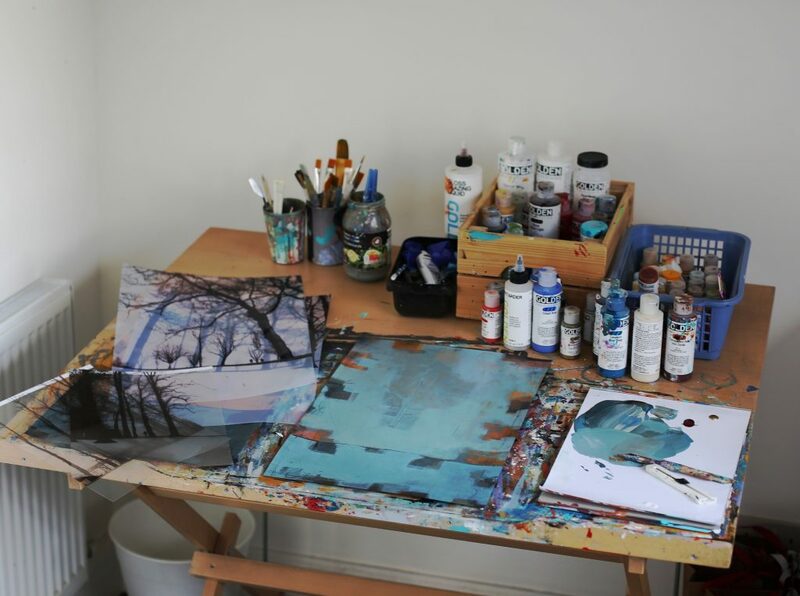 We hope you enjoyed this little insight into her studio – we think she’s fabulous!